The stores on this list specialize in and offer nothing but clothing for tall women. As a girl of height, they are your ideal stores. There's no sifting through item after item, trying to find only those in taller sizes. These retailers focus solely on clothing in longer length proportions...just the way you like 'em! Height Goddess - $$$ | up to 40" inseam | Fashionable, trendy style. Tall women's jeans and pants in up to 40" inseams. Also offers tees, dresses, and jackets in tall ladies sizes. Long Elegant Legs - $$ | up to 39" inseam | Sophisticated, classic style. Tall jeans and pants (casual, dressy, and active) in 36" inseams. A select few jeans come in a 39" inseam. 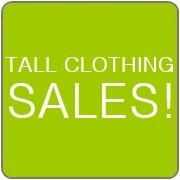 Also offers clothing for tall women such as tops, dresses, skirts, jackets, activewear, businesswear, and sleepwear. Extended sizes available. Long Tall Sally - $$ | up to 38" inseam | Tall jeans and pants in 34" to 38" inseams. Also offers women's tall clothing such as tops, sweaters, dresses, skirts, suits, coats, activewear, sleepwear, swimwear, and maternity. Extended sizes available. Shop online or at retail locations. Based in the U.K. Also in the U.S. and Canada. Mommy Long Legs - $ | 37" inseam | Specializes in maternity clothing for tall women. Small line of tall maternity jeans and pants in 37" inseams with generous hems for extra length if needed. Other clothing items to come soon. RG Maternity - $$ | up to 38" inseam | Specializes in maternity clothing for tall women. Tall maternity jeans and pants in 36" and 38" inseams. Full range of sizes from XS to XXXL. Also offers maternity shirts and skirts in longer proportions. Simply Tall - $$ | up to 39" inseam | Sophisticated, classic style. Long ladies jeans and pants in 36" to 39" inseams. Also offers tops, jackets, activewear, and businesswear in long proportions. Plus sizes available. Tall and All - $$ | up to 40" inseam | Carries tall jeans, pants, and trousers in 35" to 40" inseams and in a wide range of designs and styles. Also sells girl's tall clothing such as tops, dresses, skirts, jackets, pajamas, and activewear as well as more unique items including jumpsuits, clubwear, and clothes in bright colors and graphics. Plus sizes available. Offers a custom made service for a custom fit based on your measurements. Or, design your own styles for their specialists to construct. Based in the U.K. Tall Maternity Store - $$ | 36" inseam | Specializes in maternity clothing for tall women. Offers a collection of women's tall maternity trousers and jeans in 36" inseams. Also carries tall maternity tights and hosiery. Based in the U.K. Tall Tallula - $$ | 35" inseam | Long inseam pants in 35" inseams. Also offers skirts, dresses, dress shirts, and jackets in long proportions. Based in Australia. Tallgirls - $$ | up to 38" inseam | Long length jeans and trousers in 34", 36", and 38" inseams. Also carries women's tall clothing such as tops, tees, sweaters, dresses, skirts, jackets, activewear, sleepwear, swimwear, and maternity. Based in the U.K.
Talltique - $$ | up to 39" inseam | Specializes in clothes for tall women, especially ladies over 6'0". Extra long length jeans and pants in up to 39" inseams. Also offers tops, tanks, dresses, skirts, and activewear in tall sizes. TallWater Jeans - $$$ | 38" inseam | Fashionable, high quality, tall ladies jeans in 38" inseams. Site says 37" inseams are coming soon. Also offers a style of yoga pants in extra long inseams. Xtralength - $$$ | up to 39" inseam | Extra long length jeans and pants (dress, casual, and active) in up to 39" inseams. Also carries tall dresses and a small selection of sleepwear and maternity wear. Based in Australia. Your Long Legs - $$$ | up to 39" inseam | Extra long jeans and pants in up to 38" inseams as well as a select few in 39" inseams. Also offers tops, dresses, skirts, activewear, and jackets. Based in Canada.